Dont break out your grill for this dish. 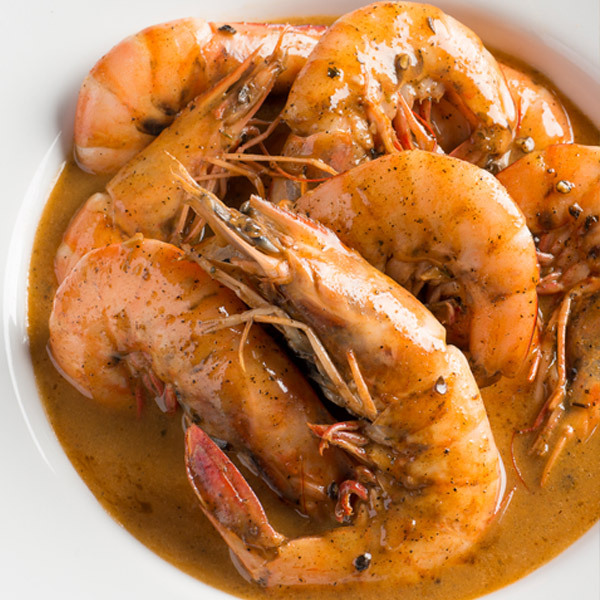 Here in New Orleans, barbecued shrimp means sautéed shrimp in Worcestershire-spiked butter sauce. We serve these shrimp with heads and tails on, so you need to dig in to enjoy. I highly recommend a bib. We are famous for our barbecued shrimp, and with reason. The biggest trick to making this taste like ours is to not hold back on the butter. The three sticks called for are enough to scare you into cholesterol shock, but are key to the flavor and consistency of the sauce. Another tip to keep in mind: to emulsify the sauce, be sure to add a little butter at a time while stirring rapidly. And dont overcook the shrimp or theyll become tough and hard to peel. In a large skillet combine shrimp, Worcestershire, lemon juice, black peppers, Creole seasoning, and garlic and cook over moderately high heat until shrimp turn pink, about 1 minute on each side. Reduce heat to moderate and stir in butter, a few cubes at a time, stirring constantly and adding more only when butter is melted. Remove skillet from heat. Place shrimp in a bowl and pour sauce over top. Serve with French bread for dipping.